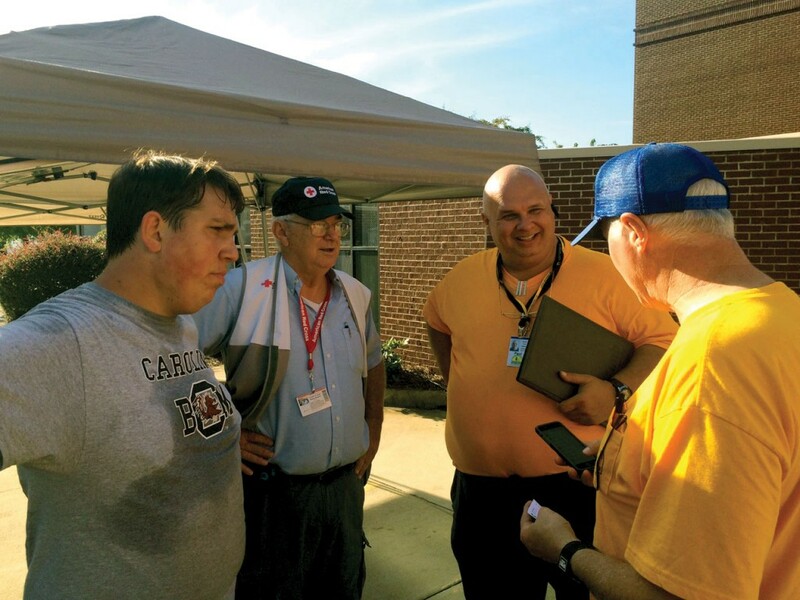 Steve Wise and Paul McKee, right, both South Carolina Blue Caps, discuss feeding plans with American Red Cross Kitchen Manager Bobby Roberts, second from left, and a local volunteer. The kitchen was set up at Riverland Church in Irmo, S.C. In the wake of unprecedented flooding in South Carolina, Baptist General Convention of Oklahoma (BGCO) Disaster Relief Director Sam Porter has offered assistance to South Carolina Baptist Convention leaders in the form of trained Blue Caps (Leaders/Instructors) and equipment to help with the clean-up efforts in the Palmetto State. As of Oct. 7, at least 17 deaths had been attributed to the millennial flood waters from Hurricane Joaquin in South Carolina and two more in North Carolina. Officials expected it to take at least a week for the floodwaters to recede before recovery efforts could commence, Porter said. When that occurs, he said the BGCO initially would send the BGCO’s maintained mud-out unit and the Union Association mud-out unit—both of which are large trailers fully loaded with the tools and equipment necessary to clean-out homes and structures to prevent mold from growing—and two Blue Caps for each trailer. Randy Creamer, the South Carolina Convention’s disaster relief director, said 70 percent of his trained volunteers had their own homes flooded, so they are in dire need of assistance. After participating in a video conference call with other state directors Oct. 7, Porter said other state conventions also are responding, with North Carolina taking a four-county area around Myrtle Beach, Alabama setting up feeding operations in the Columbia area and Georgia setting up in the Charleston area along the coast. “They are setting up a split Incident Command center between Charleston and Columbia to handle the response,” he said. For South Carolina native Mickey Caison, interim executive director for the North American Mission Board’s (NAMB) Southern Baptist Disaster Relief (SBDR), the tragedy is especially troubling. “My heart breaks as I see the historic flooding in my home state of South Carolina,” Caison said. For more information about supporting Oklahoma Baptist Disaster Relief, visit www.okdisasterhelp.org.